Please observe the following safety guidelines at all times. They are intended to protect visitors, animals and plants in the Park. Keep out of the water: paddling, swimming, boating or skating are not permitted in the Park. Please put your litter in a bin or take it home with you. Please close or fasten any gates. 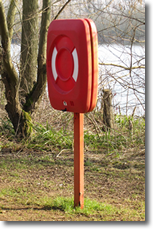 Keep your dog under close control, especially around other people, feeding ducks and cattle. This is especially important when new cattle are introduced into the river meadows. Please watch out for warning signs and take heed! Keep your dog out of the Nature Reserve. Clean up after your dog. Park Wardens are empowered to take legal action against owners who ignore this request. Do not light fires or barbecues. Take care on uneven or muddy paths. Blue-green algae forms on the lakes in the Park during warm weather. The poison they produce can kill farm livestock and domestic pets. It can also cause illness in humans. It is important that visitors keep pets and children, in particular, out of the water when blue green algae is present. It is vital that hand washing is carried out to prevent illness if you have had contact with affected water. N.B. THERE IS NO SWIMMING OR BOATING PERMITTED IN THE LAKES. Warning notices will be posted in the Park and this warning will apply until they are taken down. In humans, the poisons can cause rashes after skin contact and illnesses if swallowed. Illnesses including skin rashes, eye irritation, vomiting, diarrhoea, fever and muscle and joint pain have occurred in people who've swallowed or swam through algal scum. These haven't led to long-term effects or death but, in some cases, the illnesses can be severe. If you suspect that you have been affected, you should seek medical advice ASAP. There are two fenced-off play areas in the Park. Please note that these can become muddy after heavy rain and parents are advised that extra caution and supervision is recommended. Water safety is something that visitors need to be aware of when visiting the HOCP. The three lakes are on the site of a former quarry and can present a potential hazard to careless or unaware visitors. Please note that people and pets must not enter the water. 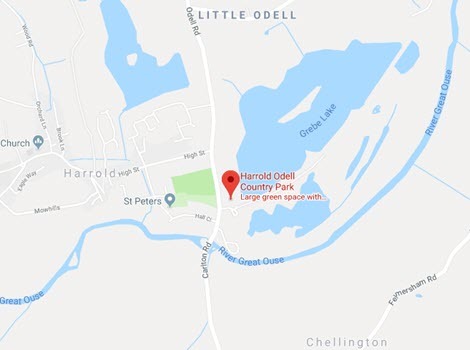 This is especially important when 'blue-green algae' warning signs are posted in the Park and/or on this website.Lifebelts are provided at various points around the Park in case of emergency. In the event of an accident or emergency, contact a Park Warden. The mobile number of the duty person is on the office door if they are not in the Park office. Otherwise, telephone the appropriate emergency services from your mobile or from the telephone in the café.